At Feigenbaum Dental, we love kids as much as they love us — and that’s a lot! Kids actually look forward to visiting our office, where we take a warm, friendly approach to dental care. To create a relaxing and enjoyable atmosphere for your little ones, we offer TVs in each room to keep them as comfortable as possible. At the end of the appointment, they get to take their pick from our prize box. We welcome kids as young as three years old in our office for superior children’s dental care. Learn more about how we care for kids, then schedule an appointment with the children’s dentist in Creve Coeur today. Before you bring your child into our office for the initial visit, keep their smile healthy by regularly cleaning those first little teeth. And even before there are any teeth, you can use a moist washcloth to clean gums after feedings. Begin flossing as soon as your child has teeth that are touching each other. Babies are at-risk for a term called baby bottle tooth decay, which occurs when the sugars in milk and formula are allowed to sit on the teeth for extended periods of time. To avoid it, clean your child’s teeth after each feeding, and avoid filling the bottle with anything that is not milk or formula. Never put your child to sleep with the bottle. Maintain good habits and by the time your child turns three, remember that it’s time to schedule an appointment at Feigenbaum Dental! 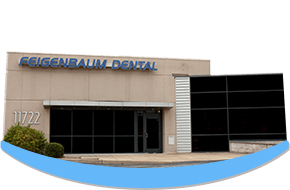 The first visit to Feigenbaum Dental is nothing to fear! We strive to make it a fun experience for everyone involved. We encourage you to bring in the whole family to help your child feel more comfortable in the new environment. During this initial appointment, our team will take a look at your child’s smile, then gently clean off any biofilm. We will also talk to them about the importance of brushing and flossing and help them understand that a healthy smile contributes to a healthy body. As your child grows up, we will continue to monitor their oral development during regular appointments. Dental sealants and fluoride treatments provide necessary prevention to help your child enjoy a healthy smile throughout childhood. Your child’s teeth are more vulnerable to cavities than your own, but a topical fluoride treatment applied at the end of each six-month checkup and cleaning can provide a strong defense against decay. Remineralization strengthens the tooth enamel, making it less vulnerable to the acids and bacteria that cause cavities. Most children can benefit from additional fluoride exposure, so ensure that your child’s toothpaste contains the mineral. Any formula approved by the American Dental Association is guaranteed to have fluoride. Has your child had his or her first visit to the dentist? If not, it’s time if they’re older than three. Request an appointment with the dentist kids love today!